A shy girl, a social guy, a second chance to get their stories right…Sarah Campbell loves living vicariously through the residents at the Redwood Cove Rest Home. But when a surly patient insists she can’t die before “setting things right,” Sarah finds she may end up taking on far more than she ever bargained for… especially since all signs point to murder. Have she and her therapy dog Lucky stumbled upon the key to solving the most famous cold case in Gold Coast history?Despite creating the world’s most popular social network, Finch Jameson lives a life of ashamed solitude. The last thing he wants is to draw attention to himself, but that’s exactly what happens when a distant relative delivers an earth-shattering confession in her dying days. Soon he finds himself more intrigued by the shy and beautiful nurse who’s committed to helping him solve his great-aunt Eleanor’s mystery than in the mystery itself. But will she ever let her guard down long enough to let him in?Can Finch and Sarah work together to solve Eleanor’s big mystery before time runs out? And might redeeming Eleanor’s legacy somehow save them both in the process?Find out if Lucky can help these two humans get to the bottom of this mystery and get a head start on their own love story. 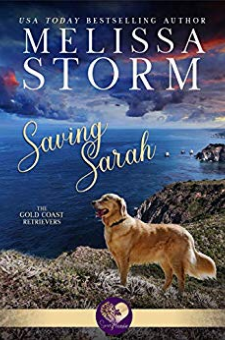 This sweet tale of suspense, secrets, and second chances is one you won’t want to miss... Order your copy and start reading today!Saving Sarah is book one in the Gold Coast Retrievers series. Each book stands completely on its own, but you'll have more fun if you read them all together!